We started by sautéing up garlic, onions and lean chicken breast. 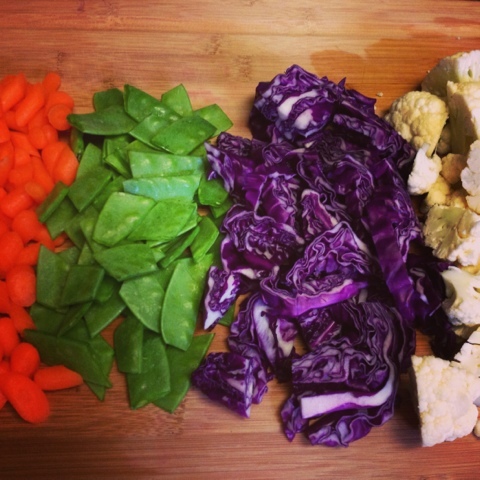 Our veggies consisted of carrots, pea pods, red cabbage and cauliflower which was a delicious and beautiful color combination. 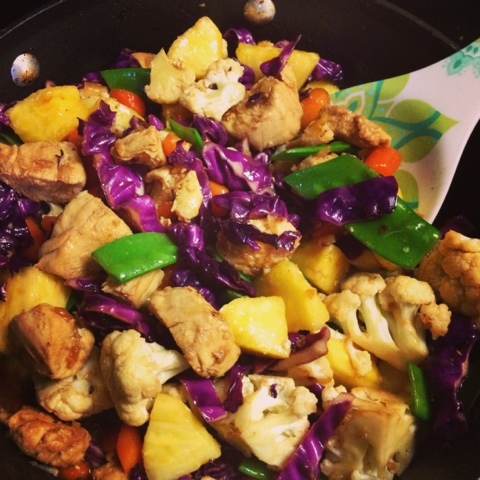 You need one cup of veggies per person so feel free to use your favorites here. 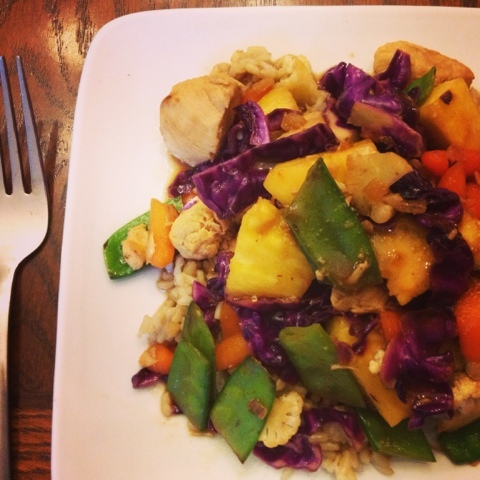 We topped this off with fresh pineapple chunks which was the perfect compliment to our orange teriyaki sauce. YUM! Another one of our favorite skinny secrets is to plate up our dinners on a salad plate vs. dinner plate. It makes our portion looks twice as big and keeps our portion control in check which keeps our waist lines happy too. 2. Add olive oil to deep sauté pan and heat to medium high heat. Add minced garlic, chopped onion and chicken breast. Cook 7-8 minutes until cooked through. Add one tbsp orange juice to pan and stir to glaze chicken then remove from pan. 3. Toss veggies into pan and cook 3-4 minutes until tender crisp. Add orange juice and teriyaki and stir to combine. 4. Add chicken & pineapple back to pan and cook an additional 60 seconds. 5. 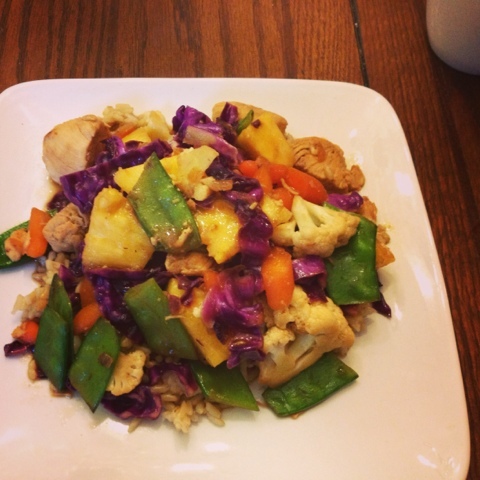 Plate up brown rice and top with chicken & veggies. Omg this looks so good! I'm going to have to try this one night! I'm a busy person and I always want to cook an easy to cook food. I would like to cook this recipe because I think it's very easy to cook. Thanks for this one.